President Cyril Ramaphosa of South Africa yesterday dashed hopes that Pretoria would immediately open its wallet and extend critically-needed financial assistance to cash-strapped Zimbabwe, the Daily News reported. However, the leader of Africa's most industrialised country also made it clear that South Africa was ready to help Zimbabwe to revive its sickly economy - although this would be done within Pretoria's means and after the regional economic giant had fully considered all the available options. In addition, Ramaphosa bluntly demanded that President Emmerson Mnangagwa and his under pressure government provide a safe and conducive investment climate for South African companies operating in Zimbabwe. 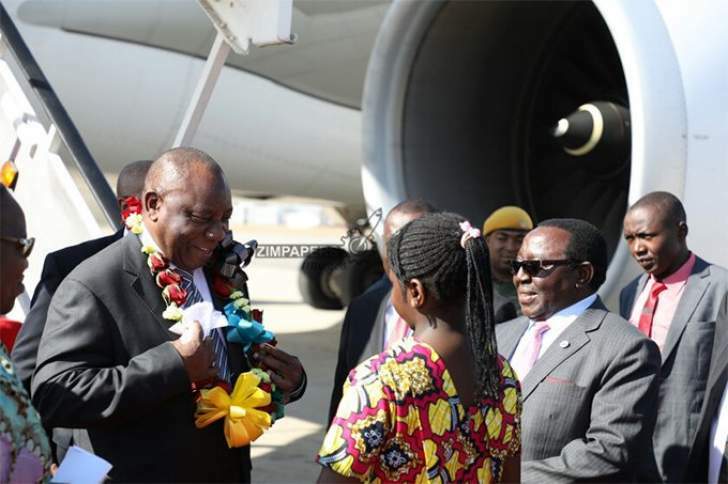 At the same time, the South African president left Harare without creating time in his busy schedule to meet with opposition leader Nelson Chamisa - who was hoping to get audience with the region's most influential statesman, to brief him about local political developments. Ramaphosa was formally in Harare to co-chair the third session of the Zimbabwe-South Africa Bi-National Commission (BNC) - which was established in 2015 - in a bid to strengthen relations between the two countries. The crucial meeting saw the two leaders and their respective ministerial teams reviewing the progress which had been made with regards to implementation of the commission's 45 key bilateral agreements - which span trade and investment, health, labour, migration, defence, taxation, tourism, water and the environment. Ahead of yesterday's meeting, hopes had been high among long-suffering Zimbabweans that Ramaphosa would deliver immediate "good news" on the much-needed financial assistance for the country, which was first mooted in December last year. But addressing journalists at the end of the BNC, the South African president said his government was yet to fully consider the much-talked about financial assistance, particularly because Pretoria was currently grappling with its own economic challenges. "South Africa stands ready to render support to Zimbabwe within our means in your quest for economic renewal. "It is our wish that, using the BNC mechanism, we should at our level strive to provide the strategic impetus to drive the bilateral relations to a significantly higher level," he said. "We have agreed that we are going to have continued dialogue on a number of issues, including investments as well as issues to do with finance and the economy, and with that we think at the BNC level we have formed a very firm foundation of being able to assist one another … as we traverse a number of challenges and difficulties. "May I say ... our efforts are really emboldened and strengthened because there is a deep level of trust, a deep level of being able to work together, very cordially, even as we have to deal with difficult issues. "So the matters that you have referred to as financial assistance, we have discussed that in great detail and the discussions are on-going and our various teams are busy finding workable solutions. "And because of the strength of our relations, we have no doubt whatsoever that we are going to find solutions that are going to lead to the strengthening of our two respective economies so that we can address the challenges that both our countries are facing at this moment in time," Ramaphosa added. This comes after South African media reported in December last year that Pretoria had turned down a request from Mnangagwa's administration for a US$1,2 billion bailout. But South Africa's Finance minister, Tito Mboweni - who accompanied Ramaphosa to the Harare BNC - later confirmed that Pretoria was indeed considering financial assistance to Zimbabwe. The country's International Relations minister, Lindiwe Sisulu, also weighed in subsequently - saying Ramaphosa's government would grant Zimbabwe the bailout that it sorely needed to address its deepening economic crisis which triggered riots in January this year. "We will help Zimbabwe as and when we are able to. If there's anything we can't do, I'm sure they can find help from other international parties. "But they are our sister country and we'd like to help solve their problems. Any assistance we can afford, we'd like to provide it," Sisulu, who was also part of Ramaphosa's delegation to Harare, said. Last month, Finance minister Mthuli Ncube also confirmed that Zimbabwe was seeking assistance from its biggest trading partner. "We are in constant talks with South Africa. They are our neighbour, biggest trading partner and we have a bi-national commission. "So we have been interacting with them to see whether they can be of help and support us whenever we need it," Ncube said. In a joint communique which was issued after yesterday's meeting between Mnangagwa and Ramaphosa, the two leaders also said they were looking at increasing a standing credit facility between the central banks of the two countries - under whose facility Zimbabwe can access R100 million from the South African Reserve Bank. "Other financing options beyond this are also being explored, for example, a facility from South African private banks to the Zimbabwean private sector and guaranteed by the South African government with an appropriate counter-guarantee from the Zimbabwean government," the communique said. Speaking earlier, Ramaphosa told the BNC that Zimbabwe, which also faces a severe drought this year, was worthy of the international community's support to help revive its economy - repeating his previous calls for sanctions against Zimbabwe to be lifted. "We want to see meaningful support being given by international development partners to Zimbabwe because Zimbabwe does deserve the support that the world can give," he said. South Africa is Zimbabwe's largest trading partner and home to millions of Zimbabweans who flocked to the country amid an economic meltdown during former president Robert Mugabe's ruinous rule. Zimbabwe is currently in the grip of a girnomous economic crisis which sparked riots in January when protesters who headed calls for a stayaway by labour unions, clashed with heavily armed security forces, leading to several deaths.